McCrometer’s exhibit at OTC will feature a flow demonstration unit. This live demo will show how the V-Cone Flow Meter conditions flow unlike any other flow technology. Conditioning the flow in the pipe ensures accurate, reliable dP flow measurement in any environment. With its unique differential pressure (dP) cone design, the versatile V-Cone Flow Meter and highly scalable Wafer- Cone Flow Meter provide superior flow measurement accuracy and repeatability regardless of space and weight constraints. McCrometer’s field-proven flow measurement solutions have met the demanding production environment of the oil and gas industry for more than three decades. 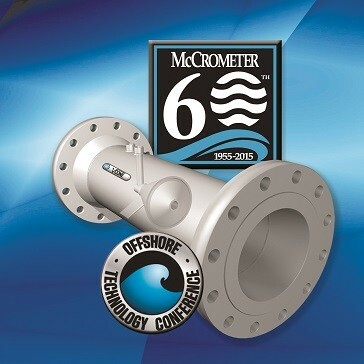 McCrometer’s V-Cone Flow Meter reduces the upstream/downstream straight pipe run required by Orifice Plates and Venturi Tubes by up to 70 percent. The V-Cone provides a stable flow profile for reliable measurement, featuring accuracy of ±0.5 percent of actual flow and repeatability of ±0.1 percent. It is ideal for the measurement of liquid, steam or gas and is available for line sizes from 0.5 to 120 inches, with an unmatched range-ability. Its no-moving-parts design provides an extremely rugged instrument. Highly scalable, McCrometer’s Wafer- Cone Flow Meter is ideal for line sizes from 1 to 6 inches in onshore well-head measurement, oil treating, enhanced oil recovery, coal bed methane, coal seam gas and oil sands applications. The Wafer-Cone Flow Meter achieves an accuracy of +1.0 percent, with a repeatability of +0.1 percent, and operates over a flow range of 10:1. At OTC, McCrometer is also celebrating its 60th anniversary as a company.